I am referring to an Unidentified Fabric Object. From eBay to flea markets, mystery objects abound, and this one is often misidentified. No wonder, it’s not something that is used today, and it was probably a bit of a nuisance to the wearer in its own time! Take a small rectangle of cotton or flannel, and gather or pleat a much longer rectangle to it, neatly finish the edges and there you have it: a tiny apron/skirt/slip/unfinished sleeve for a skinny short person! Or not. What you really have is a barrow, barrie-coat, barra-coat, barrar coat, pinning blanket, night flannel, or petticoat. 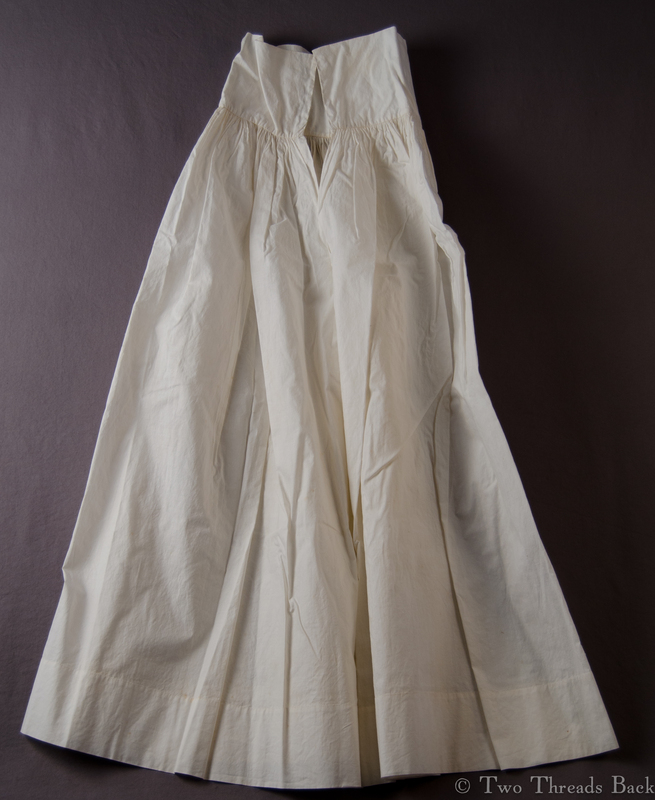 These skirts were worn by babies in days gone by, layered somewhere between the shirt and diaper (clout or napkin) and outer petticoats or gowns. “are nothing more nor less than the old-fashioned open pinning blanket, or the English barrar coat. In the simplest form, a night petticoat has a skirt of one breadth, three quarters of a yard in length. Turn a hem as shown above, of two inches, at the bottom, less than half an inch or the sides, and cross-stitch, as on the bands, with white silk. Gather it slightly into a double linen waist (waistband fashion), 22 inches in width, and 6 in length, which will allow for seams. Choose the same quality as for the bands, finer rather than coarser, as it comes next to the shirt and at first completely wraps the delicate limbs of the infant. 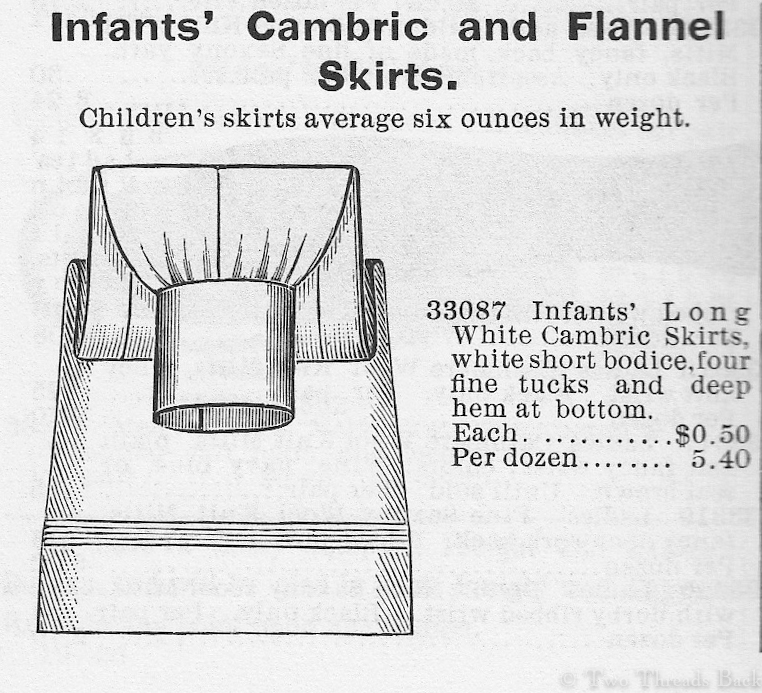 The real flannel petticoat is not usually put on until the child is six weeks old. The pinner is then used for the night, six weeks longer, when most babies of spirit kick themselves fairly out of its narrow limits. The author, Sarah Hale, goes on to describe possible trimmings and ornamentation, but suggests that “as the garment is only for transient use, it would seem a waste to expend much time or labor upon it.” And after all, most “babies of spirit” wouldn’t appreciate it. This entry was posted in Antique Clothing, Children's Clothing, History and tagged History. Bookmark the permalink. This was so helpful. I’m cataloging several of these garments in the Minnesota Historical Society’s collection of children’s wear. Many of them were donated in the 1920s-1940s and often called “pinning blankets” or “petticoats.” Now I’ll add “infants’ skirt” or “night petticoat” to the possible names. Enjoy reading your blog. I’m so glad, thank you! There are a lot of odd textile survivors out there, ones that are completely mystifying (no one knows what the heck they are) and then ones like this – obviously common once, but no longer used, so no longer familiar.